Welcome to TerribleTuesday's first post. I know it's a little later in the morning and I am figuring out how to overcome this little hiccup to compensate being a 'night owl' which will be to post ahead. Polishing up my blogging style is coming along what seems like a herd of turtles I like to say. It's the first of December, to my amazement we have no snow, as of yet. I say this very quietly so Mother Nature won't hear me and let those snowflakes fly. In honor of December 25th, Christmas, my first movie review is Tim Burton's The Nightmare Before Christmas which I highly recommend you watch. And I quote from Wikipedia, The Nightmare Before Christmas, often promoted as Tim Burton's The Nightmare Before Christmas, is a 1993 American stop motion dark fantasy musical film directed by Henry Selick, and produced and conceived by Tim Burton. 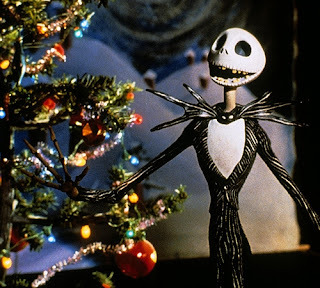 It tells the story of Jack Skellington, a character from "Halloween Town" who opens a portal to "Christmas Town" and decides to celebrate the holiday, with some dastardly and comical consequences. Danny Elfman wrote the film score. The principal voice cast includes Chris Sarandon, Kath Soucie, Jess Harnell, Ken Page, Paul Reubens and Glenn Shadix. On one of my boards on Pinterest, which you can find the Pinterest button on the my blog's right sidebar, I have a board for 'Movies, Mostly Horror' if you would like any other suggestions for a movie to watch. I have watched them all. 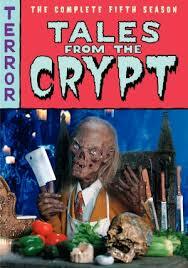 Tales From The Crypt was the first horror movie I ever watched. I was eight years old, my father and I went to the Drive-in in his truck, it was 1966 (man I feel old now) and I remember peeking over a pillow as I watched which at that age I thought was a horribly scary movie. What was the first or scariest film you ever watched? I love stories so do tell.